To secure Churches in the Palestinian territories, the “Holy See will strengthening the special relations with the PLO”. 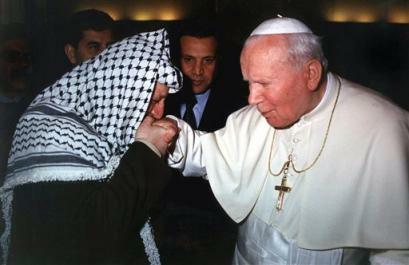 Yasser Arafat kissed the hand of the late Pope John Paul II. This is the essence from a fresh Press release in the Vatican. A Pontifical delegation has returned from Ramallah, where there were held talks between the “Holy See” and the Palestinian Liberation Organisation (PLO). The Vatican signed a Basic Agreement with the PLO in 2000. The talks aimed at a comprehensive international agreement regulating and promoting the presence and activities of the Catholic Church in the Palestinian Territories. “The talks were co-chaired by Msgr. Ettore Balestrero, under secretary for the Holy See’s relations with States, and Ziad Al-Bandak, the president’s advisor for Christian relations. The talks were held in a cordial atmosphere. “Both sides agreed on establishing a working group to elaborate the aforementioned comprehensive agreement”. The Vatican is of course flattered that an Islamic terrorist organization promises to hold Catholic Churches open in a proposed Islamic statehood, that will become a Jew-free zone. Just like Catholic churches struck a deal with Hitler to keep Catholic Churches open, while the Jews were slaughtered in gas chambers by the “German liberation organization” who ruled in Berlin. It is a shame, that there is totally silence from the Vatican, in regards to the PLO and the Islamic Worlds refusal to recognize the state of Israel. The Vatican is also hailing Mahmoud Abbas, a holocaust denier. First published: 13th of December 2010. While we can agree to disagree on issues and everyone has a different perception to events, the writer here is not presenting the truth about Catholicism and it’s views towards evil and terrorist regimes that practice evil. The truth is that the Vatican and the Holy See do not condone terrorism and the slaughter of innocents for political gain – nor the slaughter of innocents for any reason, period. As a Catholic person myself, I can tell you that we abhore the violence preached by Islamic Terrorists towards Jews and Non-Jews alike. In fact, when it comes to war, the Catechism of the Catholic Church teaches us to hold responsible any government or governmental leaders who take up arms for any reason and who intentionally condone the killing of innocents and non-combatants. The Catholic Church does not rebuke all warfare out of hand as being inherently evil. In Catholic morality the legitimate use of warfare in the defense of innocents and those being unjustly persecuted is accepted and is a duty of a state’s leadership to undertake rather than to sit back and let unjust aggression and murder go unanswered by believers. This is entirely different from, and at odds with the Islamic views of forced-conversion, Shariah Law, and Jihad. In fact, the Crusades of the 1st Millenium, were specifically undertaken by Catholics in response to the continuing unprovoked aggression and murder by Islamists against the civilian christian pilgrims in and around ancient Israel. Did singular abuses occur by Catholic Crusaders against Jews and other native people during the Crusades – yes. Did the Catholic Church and the Holy See condemn those Crusaders who perpetrated these abuses – yes. If you are in doubt, read about the consequences of excommunication imposed by Pope Innocent III against the Crusaders themselves. Is the Vatican perfect? Is the Pope infallible in all things? Are Catholics themselves infallible? The answer to all three of these questions is an emphatic NO. The same goes for any human being. The sad fact is that the old addage of “Absolute Power corrupts Absolutely” is inherent in our human condition no matter what your personal heritage is. We must all be wary of, and examine every call to arms very carefully, through the prism of good will towards all men. Your comment is pretty long. Your Comment: The Catholic Church does not rebuke all warfare out of hand as being inherently evil. In Catholic morality the legitimate use of warfare in the defense of innocents and those being unjustly persecuted is accepted and is a duty of a state’s leadership to undertake rather than to sit back and let unjust aggression and murder go unanswered by believers. My Comment: This is from the Word of Jesus Christ, our Savior. Matthew 5:38-48 “You have heard that it was said, ‘An eye for an eye and a tooth for a tooth.’ But I say to you, Do not resist the one who is evil. But if anyone slaps you on the right cheek, turn to him the other also. And if anyone would sue you and take your tunic, let him have your cloak as well. And if anyone forces you to go one mile, go with him two miles. Give to the one who begs from you, and do not refuse the one who would borrow from you. Thanks for your reply. I think you are answering some other point here. Your Bible quotes while they hold important lessons for all, do not really apply to what I am stating here. Are you implying that Jesus tells all of us not to defend the innocent, or to only use methods that do not involve the use of force? Answer me this, who would Jesus say is his disciple, the person who drives by the scene where a little child is being badly beaten by several thugs and doesn’t stop in order that they make it to church on time, or the person who, seeing this, immediately stops their car, jumps out, and attacks the attackers in defense of the child? I think I’ve stated this story on this blog before: but I’ll repeat it again. A pastor from Puerto Rico, his daughter was murdered by her husband. The pastor went to the prison, and forgave the husband and prayed for him, in hopes that he repented and accepted Jesus Christ as his savior. That is a clear presentation of how Jesus Christ wants us to act and behave. I’m not implying that Jesus tells all of us not to defend the innocent. That is not the scripture I quoted to you. The scriptre I quoted above, in Jesus’s own words says: Matthew 5:38-48 But I say to you, Love your enemies and pray for those who persecute you, so that you may be sons of your Father who is in heaven. My Comment: With the exception of the child depending on his or her age, none would be Christ’s disciple unless they accepted Jesus Christ as their savior and repented of their sins. Again you are missing my point and you are avoiding ansering my legitimate question. Are you saying in your comment that as long as someone accepts Jesus Christ as their savior and has repented of their sins, that no matter how they live and act after that has no bering on how God views their discipleship or lack of discipleship? You see, that is a conundrum. I think the book of James answers the question very effectively (James 2:14-and following). As Christians we are to put our faith into action, not just prayer in our closet waiting for some other person to be the instrument of God, but real physical action, real acts of mercy, real acts of charity, real acts of compassion – all based on the faith we received from Jesus. St. Paul did not say, put the armor of God in your closet and sit down to pray for assistance, he specifically said put on the armor of God and go forth into the world to do good! I do agree with your story about forgiveness of wrongdoing after the fact. Pope John Paul II set an example for all of us Christians by visiting the prison and forgiving the would-be assassin who shot him. The thing about human forgiveness though is that there are still community consequences to your actions that must be reconciled to preserve peace. Your Comment: Are you saying in your comment that as long as someone accepts Jesus Christ as their savior and has repented of their sins, that no matter how they live and act after that has no bering on how God views their discipleship or lack of discipleship? My Comment: Observer I answered your question fairly, and most importantly according the Word of Christ. If a person sees someone attacking a child and comes to rescue the child, that is a noble thing. But that is not what get’s you into heaven. Accepting Jesus Christ as your savior, repenting and living according to the Word of God is what gets you into heaven. Jesus said in John 14;6 Jesus answered, “I am the way and the truth and the life. No one comes to the Father except through me. My 7 year old daughter can read that and understand what it means. So any adult who reads it, and chooses to live another life instead of a life for Christ, then they are making a wrong choice which can result in eternal torment unless they repent. Phillipians 1:27: Whatever happens, conduct yourselves in a manner worthy of the gospel of Christ. Then, whether I come and see you or only hear about you in my absence, I will know that you stand firm in one spirit, contending as one man for the faith of the gospel. And there are other bible verses, that tell us how we should behave. Now, I’m not saying we are perfect, because only God is that. I sin everyday and make mistakes, and Thank you Jesus because he continues to forgive me. Only God knows are heart. I can hear someone say they accept God, and behave like a christian, but have a hatred inside of them only known to God. Which is why Our Savior is the judge, and only knows what’s truly inside of us.